It is crazy to think that just two years ago today we were flying back from our first month in the Czech Republic. Our hearts were stirred all the more for the people here, and we were convinced that the Holy Spirit was calling us to this place where we would plant our roots deep. It was a long voyage here, and we are incredibly grateful for those who have partnered with us on this journey to work with the local church to see Gospel centered churches planted. And now that we have lived here for over a month now, it is very clear that what has been stirring in us is confirmed. We have been able to make this place a home. And while there have been a number of difficulties along the way, the joy and adventure with God through it all has been worth it. We traveled through 11 States in 2 months. The High Five Tour gave us great memories of seeing many of our friends and family before being sent out. Thankfully the kids slept for a good portion of the flight over the Atlantic. Unfortunately, on the first night they were all up and playing loudly at 1:30am during our first night. Needless to say, it has been a whirlwind month and a half. Upon arriving here 4 of our 5 bags were missing, which is never fun, but a few of our Czech friends met us at the airport in Prague and drove us back to Olomouc, where we were warmly greeted into our new home. A day or so later, the entire community got together for a welcome BBQ, where we got to meet more people from the community, and it wound up being a really good opportunity to get to know new people who are not apart of the church. After a long flight and a long drive, this was extremely warming to the heart. The kids got to crash their way through the paper into their new home. The welcome home party was a lot of fun (even though we were feeling jet lag pretty strong at that point). I don't think we could have asked for a faster set up than what we had. The first week was very fast paced, and I wouldn't recommend that for most people, but with the two weeks of camp ahead of us, we were able to get the house mostly set up with furniture, internet, and a plethora of little things that you don't really think about until you don't have them. All of this happened almost seamlessly because of our new friends at Metro Church. These people bent over backwards to help us, and the fact that we feel a lot more at home at this point is largely because of them. I will share more about our new church later, but to find a group like this has been an incredible blessing. With all of the newness of everything and the fatigue of travel, we were then told on our second day that we needed to register with the foreign police by day three. This was a bit of a shock, because we didn't know where to go. So, after a mountain of research, we found the center in Prerov, which is about a 30 minute train ride from Olomouc. So, after a 30 minute walk to the train station with the kids and another 45 minute walk to the foreign police station in Prerov, we were told, after an hour wait, that we need to go to the foreign police in Olomouc. So, with a heavy sigh, we made our way back to Olomouc, and after a bout of trying to explain why we were there to the officers (Thank God for Google Translate!) we finally finished our registration and were officially in the country. While we were all exhausted from that excursion, we had successfully navigated the transit system without help and we figured out where to go when we re-apply for our next VISAs in 3 months. Shopping is not all that different, but there are little things that you need to know (such as which kind of flour to get, since there are about 40 different kinds). Before meeting at Metro, we had the opportunity of connecting with Majak church in Vsetin. This is the church that helped plant Metro. After a quick week of trying to get gather our composure and set up as much as we could, I was off to meet with a team from our sending church in Oklahoma City. It was incredibly encouraging to have them with us. With so many things happening at once, it was a big comfort to have people who share our heartbeat for Christ and the lost to come alongside us amongst all of the unknowns. Our focus was to teach English to kids (ages 9-12) and be a resource to the Czech team, who had the opportunity to invest in them in their own language and share the Gospel. Most of the children do not have access to a Gospel focused church, so for many of them this was the first time that they had been introduced to Jesus. There were many highlights from the camp, and some challenges as well, as having a room full of young boys can be a handful. But we were able to encourage the Czech team along the way and we got to see some of the kids begin to ask questions about spiritual things that they previously wouldn't have been asking. 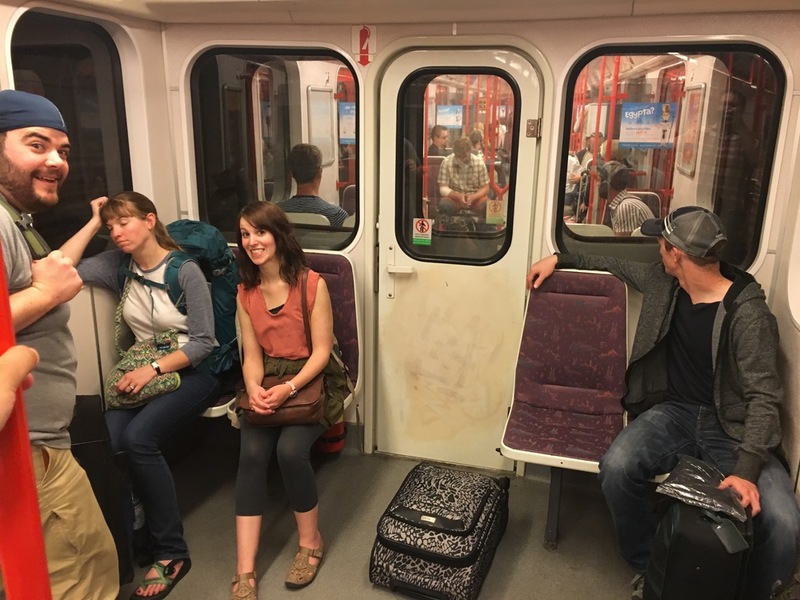 Meeting the Bridgeway team in Prague was almost a mirrored image of how we felt on day one. They were incredibly encouraging to have here. Experiencing the beauty of Prague before making our way to camp in Brno. The workshops that went on during the day gave the kids some practical tools for everyday life. Trison and I taught English to 12 very energetic boys, ranging from 9-12 years old. Camp games gave the kids an place to let loose and have fun. Then every evening it would quiet down for a lesson, where each night led up to the Gospel being made clear. Following the first camp, we had to say our goodbyes to our Bridgeway family (it was too short), and then after a day of rest we were then on a train to Ostruzna for a Family English camp. We did not fully know what to expect, as this was the first time we had been apart of something like this, but it was also the churches first time putting one on, so we had the opportunity of learning together. The camp consisted of families from the church and both believers and non-believers from various towns, as well as a short team from a church in Tennessee who came out to help. This was a very different kind of camp from the previous one. Where there was seemingly non-stop high energy with the kids camp, this had a more relaxed tone, where events gave the families something to do and conversations could happen more naturally. Each night someone from the English team would share their stories of how God impacted their lives, so we shared not only about how God rescued us through the Gospel, but also some of the ways that He would guide us through the various stages of life leading us to the Czech Republic. It was a great week, and while it took some time to slow down, we were finally able to get a little rest when we landed back in Olomouc. Checking out a model layout of Olomouc with Eddy and Trevor. Making our way on the train to Ostruzna. During the camp we had the opportunity to explore some old bunkers constructed right after WWI near the border of Poland. Campfire conversations are the best.